Sarees are considered to be traditional, but recent times have proved that it has outgrown that tag and can be worn with a contemporary twist. You may have seen many Indian actresses and other famous celebs wearing sarees in different ways to award functions, public gatherings, etc bringing back the old heritage into practice. Saying that, we still see a majority of women stick to the regular style, owing to their hesitation to try something different and only a very few really dare to take the offbeat route! With people all over the world experimenting with draping styles, abstract patterns, eccentric colour combinations, blouse designs, pairing with funky accessories... and the list goes on; why should one hold oneself back? After all no women is too old to stick to one kind of material, drape , colour or design! So go ahead, be playful and drape your way to a stylish new you! Tussar silk, despite its slightly rough texture, is an ideal material to wear on a cold, foggy day! It is one amongst the many silk varieties that is stiff yet comfortable. 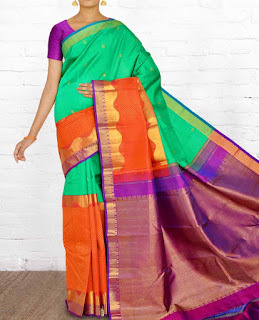 Women who feel silk sarees are heavy-duty must check out Tussar Silks! These mesmerizing Samudrika Sarees, are designed with such care and caution that no two sarees are of the same design, making it hard for women in selecting just one! The craze for Banaras sarees hasn't changed with time and it tops every girls saree wishlist. Why? Because of two reasons- 1. 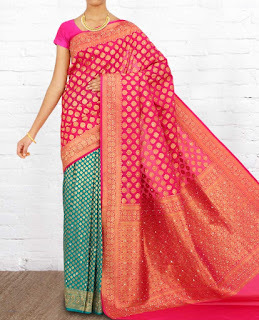 It is still considered to be one of the traditional sarees 2. Intricate embellishments and unique compositions! We may have witnessed several revolutions with respect to fashion, but Cotton Sarees still rule the day! They can be worn to various occasions in versatile ways and are the most popular material for saree wearing fanatics. Take a look at our collections. Walk into our store or visit our site at www.pothys.com to shop from the widest range of collection! You can also gift your loved ones gift cards from Pothys.